This entry was posted in analysis and tagged apple ipad work pc by charlesarthur. Bookmark the permalink. You haven’t stated whether or not you touch type. If you do, I find it hard to believe you like that keyboard. Even the less than wonderful keyboards on the new MacBooks and MBPs seem better than the membrane job for me. I love my iPad but editing text and typing on it, even with a bluetooth Apple keyboard is rough by comparison to a MacBook / Pro. I do touch type. You think someone can be a journalist this many years and not? And yes, you’ll have to fit this into your belief system: I do like the iPad Pro Smart Keyboard. It’s not a Bluetooth keyboard – it’s not separate. As the picture shows, it’s right there as if it were a laptop. 22 years writing for a living, and only two fingers ever employed! Have you taken a look at Ulysses? I’ve not used MarsEdit so I can’t compare them but Ulysses is a really good text editor that integrates very well with Workflow and also publishes directly to WordPress. I haven’t looked at Ulysses. I think it’s one of those things where you either go with Ulysses or Scrivener (I have the idea of their both being for bigger writing projects). But the fact that the WordPress app intergrates with Workflow, and so Pythonista, means I’m able to do with Workflow/Pythonista/Wordpress app what I used to do with Applescript/MarsEdit. If you don’t already check out Federico Viticci at macstories.net and Ben Brooks at brooksreview.com. Both have written extensively about going iPad only (and both swear by Ulysses, although I’m sure one uses Scrivener as well). I used Ulysses for a year and then they went to subscription. At that point I switched to iA Writer. It’s a very similar writing-focused interface and also allows for fairly easy publishing to WordPress which was a feature I really wanted. I’ve been using it for the past few months and am very happy with it. @Beardy Star Stuff – this isn’t really the right place to ask this – but why did you not want to pay for a subscription for Ulysses? I was happy to pay because software is normally expensive (but Ulysses is only £26/year) and I know that it pays for one of my favourite bits of software to stay supported in future years. Panic (who make Coda) have just discontinued the iOS version of Transmit (which I also used heavily) because it didn’t cover its costs. I think there’s a real problem with iOS software and the amount of money people expect to pay for it. I’m happy to pay more for apps and agree they are for too cheap. That said, I’m not in favor of a subscription model. For apps I really need, I’d be happy to purchase every year or two assuming active development is going on that warrants on-going purchases. Regarding Ulysses, I simply don’t care enough about the app to pay that much per year. I don’t need it to make a living. I use it to blog and I’ve never made a dime blogging. I’d previously used ByWord which isn’t too bad but felt clunky. I tried iA Writer and really liked it. It’s probably too cheap too and I’d pay more for it. But again, I wouldn’t subscribe to it. But I’d probably for a new version every year but not more than $8-10 bucks. It simply comes down to my budget, need and utility. If the Ulysses’s sub was $10 a year I might have kept at it even with the subscription model because the cost was reasonable in my context. That said, thinking about Transmit and Coda, I’ve been growing frustrated with those iOS apps. From MY perspective the development has been too slow. When Panic dropped Transmit for iOS I made a plan to drop Panic and have done so. No had feelings but from my perspective development is too slow and it lacks features I want. In particular it lacks iOS 11 features that I want. I DO use those apps for my living and would have paid more for both of them. Instead I’ve switched to Textastic and FileBrowser. Between the two of those I get iOS 11 features such as drag and drop, Files integration and more open access to my html files which I can now sync between all devices in iCloud. I was already using FileBrowser but was happy to pony up the money for Textastic because the cost was reasonable (too low). Same with Affinity Photo. I’d easily pay double for those because I make my living with them. My point is, I’ll pay more for apps but I’ll drop them if they’re not being actively developed. Further, I don’t like the subscription model because I think it goes too far in the opposite direction. Sell your product and I’ll buy it if I need it and it fits in my budget. Fix the bugs. Update for new iOS features. Add new features as you see fit. Chances are good that I’ll choose to buy it again for those updates. It’s a model that’s been around for a long time and I prefer it. It’s on the seller to budget their funds just as it’s on me to manage my own. I don’t ask my clients to subscribe to my services either. It’s on me to manage my funds between sales/jobs. I know it’s a different case but subscriptions (in the case of apps) feel similarly. I could go on but that’s probably too much already. Not sure if I understood ‘inline URL’ complaint right, but you can touch an image, wait for Drag, then wait a little more. 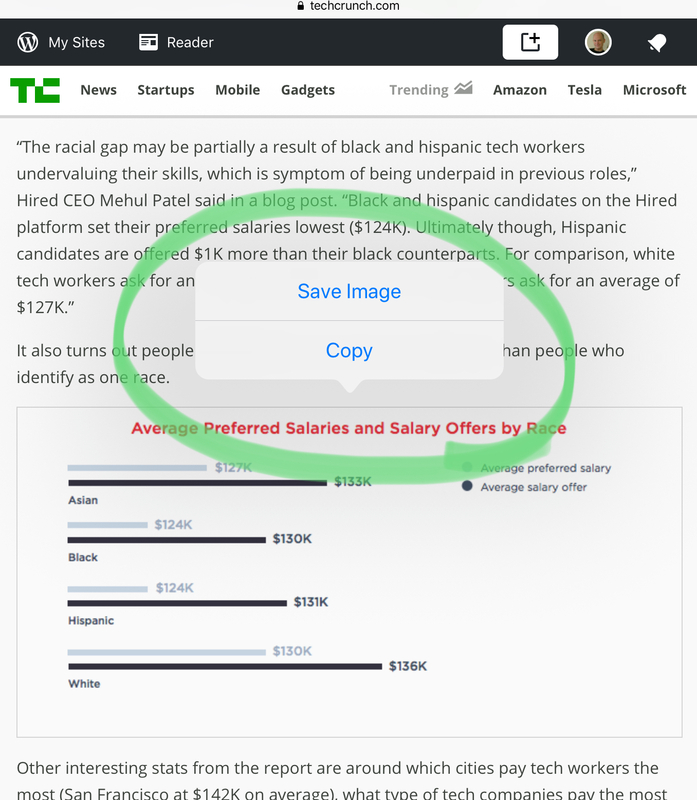 You’ll get a pop-up with ‘Copy’ option at the end of the list. No extra step needed. Nice article. The only thing keeping me from making the switch to iPad full-time, is the need to mount network shares and edit/save files right from said share. Citrix offers a solution for this, but my understanding, is that it requires an enterprise level installation. if Apple would provide this functionality, like the Mac already has – I could make the switch. I suspect there might be ways to access network shares (SMB?) – have you looked at Coda, which is an FTP/file editing program? – and it’s always helpful to dig around the App Store. Re RSS, I haven’t thought about Feedbin. Once the Mac is repaired, I may severely triage my RSS feed list, as NNW now struggles terribly with it (it used to be really fast in older versions; somehow they’ve made it slower and worse). And sure, I might try something like Feedbin. Thanks for the advice. I’ll second the idea of looking at Coda. It’s really an editor for web developers, but it will load up all different types of network shares and let you edit and arrange files on that share in-place. I will definitely check out Coda. The key will be if I can open and save to that share with Word & Excel for iPad. Thanks! I would have a look at FileBrowser. It comes in three varieties, I’m using the standard. I don’t use Word or Excel but I use Pages and Numbers and have no problem navigating to my local Mac or to an ftp server using the app. From there I can open and edit Pages/Numbers in place from within the document picker of the appropriate app. I would suggest FileBrowser. It comes in three varieties, I’m using the standard. I don’t use Word or Excel but I use Pages and Numbers and have no problem navigating to my local Mac or to an ftp server using the app. From there I can open and edit Pages/Numbers in place from within the document picker of the appropriate app. 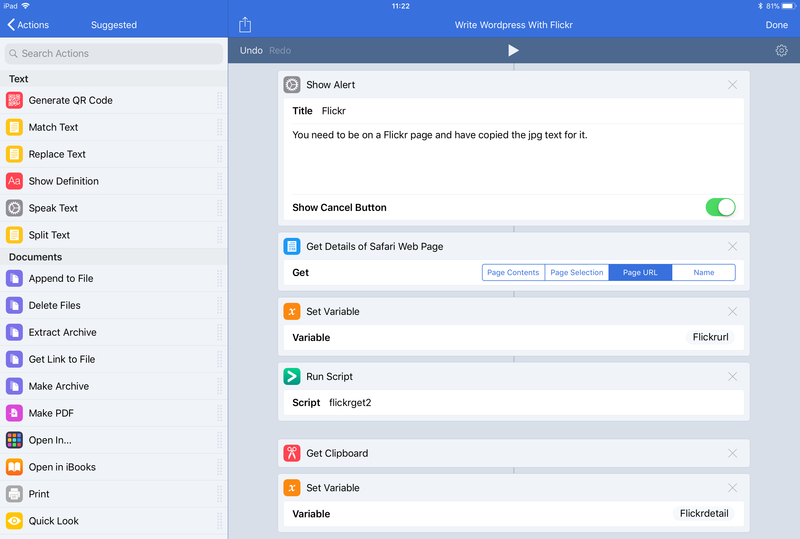 Has excellent drag and drop support as well as proper integration with the Files app. Wow! FileBrowser does the trick! Not only does this help me personally, but we can begin evaluating iPads as laptop replacements! Thank you. Dan. Excellent!! I’m very happy to hear it! * most of my stu digital and also I use bits of software like Nvivo (a qualitative data analysis package) and the like where it’s handy to have constantly open and present while I’m writing rather than flipping between windows. So I bet I could get by but I like having two 26″ screens and a big mechanical keyboard to bash on at home. 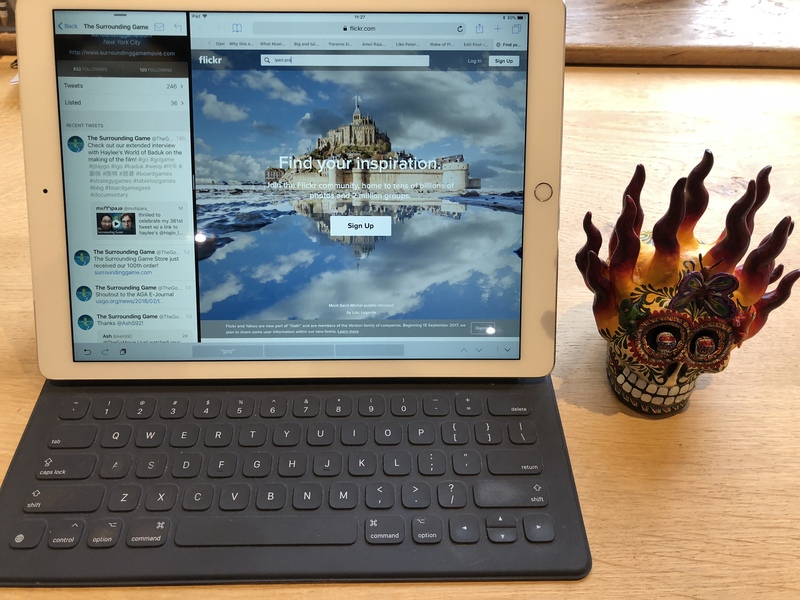 * Here’s what I think is a surprising omission given how popular Ipads are in education – it’s an absolute faff to use your ipad and project it to a screen while mobile – I’m amazed how clunky the solutions are – the *best* I’ve seen is to buy an apple TV and lug that around with me. This is one area the Surface pro seems to have apple licked – I have a dongle – I plug it into the HDMI slot in the classroom and hit *connect* and I’m done and can move around the classroom with the pro talking to people as material is projected on the screen. It’s really that easy. Can’t comment on the data analysis package (and that sounds like it needs lots of space to show it). On the projection to a screen – there are dongles for VGA/HDMI and whatever the thing that’s a step up from VGA is. I use them all the time; presenting from an iPad (using iPhone as a remote) is a breeze. Do you miss having a mouse? I have fingers. They do the job pretty well. As I say in the post, the targets on the iPad are larger (because fingers) so you get less information density. But I don’t miss the mouse at all. I haven’t used an external mouse for years anyway; I’ve used the trackpad on my laptop. Re Google Docs, have you tried the iCabMobile browser? You can set it to make web sites think you are using another browser, like Safari for the Mac when you are using iOS (Settings>Web Sites>Browser ID). Great article, thank you for writing it. I use my iPad extensively when I travel, as it is way lighter than my Mac or windows machines and does everything I need. I am looking forwards to an improved exchange mail client, but Outlook does a good job for work until something with better search arrives. The office apps are enough for my needs, and I’ve recently had to prototype app designs and found nice tools for that. The tip for Pythonista is appreciated, I’ll be looking into it. Excellent article! I recently had the exact same problem: Retina MacBook Pro mid-2012 stopped showing video on its screen (although I hear the boot chime and can use the computer with VoiceOver). Did you manage to have your computer accepted under the Repair Extension Program for Video Issues? I’ve faced many problems trying to convince the Apple Representatives in my city that my computer should be repaired under this program (there are only two Apple Stores in my country and both are very far from my city). Nice article! I use a small, plastic kitchen cutting board under the iPad on my lap, it’s almost the only way I use it. I also touch type, and after getting used to the Smart Keyboard, agree that it has all of the benefits of the think MacBook keyboard, but avoids the dust problem. If they can make the laptop with this Smart Keyboard covering, they can relax, IMO. But as I said, I think the problem with thermal emission – venting air around the keys – prevents that. Pity. Yet another writer exclaiming that, lo and behold, you can write well on an iPad Pro. That is a bare minimum requirement for any device. And it’s a FAR cry from making it a laptop / professional mobile device replacement. My iPad has become a secondary device, far more limited than my Surface Pro for professional usage. Oh and on that subject, regarding your (somewhat out of place) comment on the Surface while criticizing the obvious lack of lapability if the iPad Pro: “That wouldn’t be improved by the Microsoft Surface’s adjustable leg, because I can’t adjust the length of my femur to cope with where the slide must rest for a specific screen angle. )” .. Absolutely WRONG. I use a Surface in every orientation from an almost vertical screen to an almost horizontal screen on my lap, and it works well. Certainly better than the joke of a solution offered by the “smart keyboard”. Maybe your experience is different, but I get the impression from your comment that you’re simply parroting what you’ve heard about it from the Apple devotee crowd. More to the point: the tasks I’m doing aren’t just “a writer”. As pointed out, to write The Overspill, I query an API, construct a blogpost, and need interaction in the script. Also, there are other occasional non-writing data-intensive tasks that I do, for which I’ve also written Python programs in Pythonista. You don’t say what tasks you do on your Surface Pro, and why the iPad doesn’t meet your requirements. But I’m guessing that it’s something about “real work” from your use of the word “professional”, which as usual drags us back to the topic this post revolves around: as soon as an iPad can do X, people declare that X isn’t “real work”, but that Y is. If an iPad then gets the capability to do Y, it’s declared that Y has never been “real work” – actually it’s Z. And so on. Let us know what your X, Y and Z are. As I and others say, if you’re into podcast recording, the iPad isn’t there yet (can’t Skype and record…), and ditto video editing beyond iMovie. Well, it’s a good thing that the iPad does allow users to type on it! I use it to manage 12+ client websites. That’s content updates as well as design updates and all new designs as needed. Plenty of apps available for web-coding and file management. It’s also a great thing (for me) that I have access to a variety of apps for graphic design. I’ve used my iPad for designing postcards, brochures, posters, logos, and more thanks to apps such as Affinity Photo. If you’re iPad became a secondary device that may be it’s limitations or it may not. Depends on the work you do. There are plenty of us using it as primary computers and we’re not all “just” writers. As always, Charles, great ideas and writing. Thank you. I, too, would love to see MarsEdit for iPad (which Daniel J. says is on his to-do list). Until then I often use the WordPress app, but since it is simply a wrapper on the Web UI, I am always uneasy about loss of material with a live connection. (Same concern about using the Web UI on my iMac of course, but at least it tells me if there is an intermittent loss of connectivity!) Do you share this concern? Or do you have some offline work-around that I have missed? I will often draft stuff in Notes – it has iCloud sync but doesn’t rely on it. Haven’t looked at how well hyperlinks carry over though.